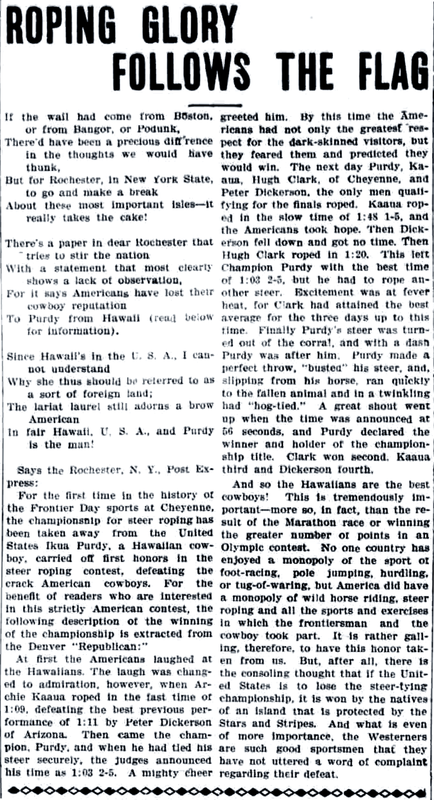 More mele and coverage of the Waimea cowboys, 1908. About these most important isles—it really takes the cake! To Purdy from Hawaii (read below for information). In fair Hawaii, U. S. A., and Purdy is the man! At first the Americans laughed at the Hawaiians. The laugh was changed to admiration, however, when Archie Kaaua roped in the fast time of 1:09, defeating the best previous performance of 1:11 by Peter Dickerson of Arizona. Then came the champion, Purdy, and when he had tied his steer securely, the judges announced his time as 1:03 2-5. A mighty cheer greeted him. By this time the Americans had not only the greates respect for the dark-skinned visitors, but they feared them and predicted they would win. The next day Purdy, Kaaua, Hugh Clark, of Cheyenne, and Peter Dickerson, the only men qualifying for the finals roped. Kaaua roped in the slow time of 1:48 1-5, and the Americans took hope. Then Dickerson fell down and got no time. Then Hugh Clark roped in 1:20. This left Champion Purdy with the best time of 1:03 2-5, but he had to rope another steer. Excitement was at fever heat, for Clark had attained the best average for the three days up to this time. Finally Purdy’s steer was turned out of the corral, and with a dash Purdy was after him. Purdy made a perfect throw, “busted” his steer, and, slipping from his horse, ran quickly to the fallen animal and in a twinkling had “hog-tied.” A great shout went up when the time was announced at 56 seconds, and Purdy declared the winner and holder of the championship title. Clark won second, Kaaua third and Dickerson fourth. And so the Hawaiians are the best cowboys! This is tremendously important—more so, in fact, than the result of the Marathon race or winning the greater number of points in an Olympic contest. No one country has enjoyed a monopoly of the sport of foot-racing, pole jumping, hurdling, or tug-of-waring, but America did have a monopoly of wild horse riding, steer roping and all the sports and exercises in which the frontiersman and the cowboy took part. It is rather galling, therefore, to have this honor taken from us. But, after all, there is the consoling thought that if the United States is to lose the steer-tying championship, it is won by the natives of an island that is protected by the Stars and Stripes. And what is even of more importance, the Westerners are such good sportsmen that they have not uttered a word of complaint regarding their defeat. The Hawaiian Star, Volume XVI, Number 5143, Page 6. September 23, 1908. This entry was posted in America/American, English Newspaper, Mele, Paniolo, United States of America and tagged "Denver Republican", "Post Express", Archie Kaaua, Chronicling America, Hugh Clark, Ikua Purdy, Ikuwa Purdy, Peter Dickerson by nupepa. Bookmark the permalink. Awesome resource, thank you so much for providing!